​EdTechX Asia is back in Singapore! We’ll be at Singapore EXPO from 31 Oct – 1 Nov 2017, as Asia comes to the fore in advancing 21st century global EdTech growth. Organised in partnership with EdTechXGlobal and SingEx Exhibitions, and themed “21st Century Education and 21st Century Skills”, EdTechXAsia is programmed in collaboration with an international advisory panel to attract a unique community of worldwide education makers and shakers at the forefront of industry, innovation and investment. 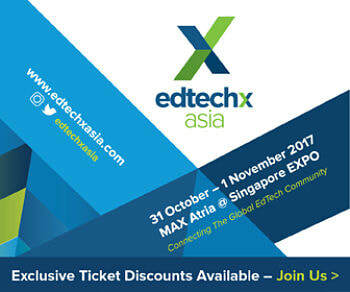 Visit us at EDTECHXASIA SUMMIT, EDTECHXASIA CONNECT, and EDTECHXASIA EXPO for the full-suite EdTechXAsia experience.